Native American Indians were a deeply spiritual people and they communicated their history, thoughts, ideas and dreams from generation to generation through Symbols and Signs such as the Bird Symbols. Native American bird and animal symbols and totems are believed to represent the physical form of a spirit helper and guide. Bird symbols are very special to the Native Americans, their ability to soar above the clouds, perhaps to the heavens, and their sense of freedom inspired many. The many birds of North America are featured as bird symbols, many having different meanings to different tribes. However, because of their amazing power of flight, many are revered as bringers of messages and symbols of change. They include song birds, water birds and birds of prey. Birds often symbolised light-hearted freedom and the Feathers have many spiritual & ritual uses. For additional information please refer to Animal & Bird Totems and the Meanings of Animal Symbols. Numerous Native American Indian legends also deal with birds and the origin of the various colors of feathers. The Navajo tribe believe that when all living things climbed to the stalk of a bamboo to escape the Flood, the wild turkey was on the lowest branch and his tail feathers trailed in the water. This why the feathers of the turkey have no color - it was all washed out. Bird Symbols has different meanings in many Native American tribes. The meaning of Bird Track symbols was to signify the presence of birds, especially wild turkeys in the area and indicate where they could be found, or the direction they were taking. Bird Track symbols signified a good omen and conveyed authority. The meaning of the Crow symbol signified wisdom and some tribes believed that the Crow had the power to talk and was therefore considered to be one of the wisest of birds. The Native Americans consider the bald eagle and the golden eagle to be sacred. Bird symbols depicting these birds of prey were common in many tribes. The meaning of the Eagle symbol was to signify courage, wisdom and strength and its purpose was as the messenger to the Creator and as such was revered amongst the Bird Symbols. The hawk is believed to continuously fly fight, protecting people from the evil spirits of the air. The Hawk symbol is closely associated with forces such as rain, wind, thunder, and lightning and sometimes referred to as a 'thunderer', as do many of the bird symbols. Hummingbirds are always depicted in their bird symbols as a mated pair and a symbol of devotion, permanence, eternity and life cycles. Owls were believed to be messengers from beyond the grave and Owl symbols signified warnings to people who had broken tribal taboos - these bird symbols signified a bad omen. The Raven symbol signifies that danger has passed and that good luck would follow. 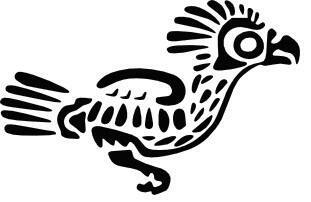 Bird symbols, myths and legends: The Thunderbird symbol is one of the most iconic Indian signs. The name of the Thunderbird name originates from the belief that the beating of its enormous wings causes thunder and stirs the wind and the sound was viewed by some tribes as an omen of war. The Native Americans believed that the giant Thunderbird could shoot lightning from its eyes. The Piasa is an Illini word meaning "The bird that devours men" and according to their legend children and adults were carried away and eaten by this bird monster. The Piasa Symbol is one of the most feared of all the bird symbols. Bird symbols were depicted in many guises by the ancients and had many meanings. The Mississippians, who were the people of the ancient Mound Builder culture, believed that the universe consisted of three worlds that were linked together with good and bad spiritual forces. The Underworld was inhabited by spirit snakes and Serpents, the Upper world was inhabited by spirit birds and the people of the earth who were ruled by other spirits. The Great Serpent symbol was an inhabitant of the Underworld and represented chaos, corruption and darkness - the terrifying monster had wings and the power to fly. The Feathered or Winged Serpent Symbol, was another such creature with the power to fly but was generally viewed as a benevolent, although fearful, creature. The Bird Man was believed to be a supernatural deity who resided in the Upperworld with the spirits of the Sun, Moon and Stars. The Bird Man was portrayed by dancers as strong, high flying predators in the guise of an eagle, hawk or falcon. Falcon dancers would perform in ceremonies supplicating the spirits of the Upperworld. Each of these fantastic ideas were symbolized by amazing Bird Symbols.